Judas Priest fanatics rejoice, the band have released the ultimate collection chronicling their entire career in this box set. The four CD set is a lasting tribute to this incredible band, and quite a well-done package at that. Obviously, any time you are trying to condense down the career of a group who has been as prolific as JP over the years, there will be differences of opinion as to what should and should not have been included. I doubt that any band could ever do it to the exact specification of their fans. I suppose the only way to truly pull that one off would be to include the entire catalog in the set (a few bands - Steely Dan, ZZ Top - have actually done this) but for most groups this would defeat the purpose and be virtually impossible. The Priest have opted to compile a set consisting of material from every album they have ever released. They have also managed to include some very interesting unreleased, or at least never on CD material to fill out the collection. The result, although, again, I could quibble with some of the selections, is a set that, like their career is a bit of a mixed bag, but has much more powerful material than weak. I think that it does a nice job of encapsulating the career of this highly important metal band. 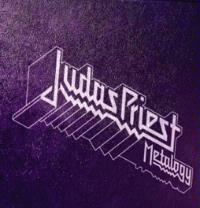 Judas Priest were at the birth of heavy metal. Although they did not get a recording contract until the early 1970's, they were playing music at the same time, and in the same place, as Black Sabbath as that band was pioneering the genre of metal. Priest's first disc, Rocka Rolla, felt a lot like the bluesy early Sabbath. By the time they recorded the follow up, Sad Wings of Destiny, though, they had forged their own sound. It was a slightly off-kilter, highly unique, almost psychedelic take on the metal sound. This style was truly made reality by both a combination of KK Downing and Glenn Tipton's angular circling around one another on the fret board, and a times dueling, and the immense vocal talents of Rob Halford. Halford, in the opinion of this reviewer had, and still has, the finest voice in the business. A few people (Geoff Tate, Ronnie James Dio, DC Cooper and Bruce Dickinson come to mind) come close, but the combination of a strong and decisive delivery and incredible range (the man can jump from incredibly low tones to screams that seem almost in the dog-only hearing range in a heartbeat) make Halford a force that is unequalled. As the band made their way forward they moved into what was a more mainstream metallic sound. The thing is, they were really creating and forming that sound, always pushing the cutting edge, rather than just copying. By the time of British Steel, the American audiences were ready, and "Living After Midnight" and "Breaking the Law" took them from obscurity onto the arena stages. The age of Priest was a hand. The band moved through several more albums, all with greater and lesser degrees of critical and commercial success. In this reviewers opinion the Point of Entry album, with its experimentation of a new form of metal, was always one of the high points. At the other end of the spectrum the poppy, hair metalish Turbo was almost without argument the least effective disc the group ever recorded. As the band carried on, they eventually ran into the bane of all bands, personal and musical differences, that lead to the departure of Halford. This had been, other than what seemed like more changes of drummers than Spinal Tap (although none spontaneously combusted), the only personnel shift in the band since they began recording. Ripper Owens, at the time singing in a Judas Priest tribute band, stepped up to the plate to replace Halford. The group recorded two studio albums with Owens, but now Halford is back in the fold, and the circle is complete. This box set goes a long way towards capturing much of that rich and important musical legacy. For Priest fanatics like myself the rare tracks and live DVD (a Screaming For Vengeance tour show that has been long out of print) will surely make this set a must have. For those who have been wanting to make the plunge into the catalog, this could well be a good, but pricey starting point. It surely gives a realistic and balanced view of the history of the group. From the debut Priest disc, Rocka Rolla, this bluesy rocker is slow paced, but quite cool. After the verse it jumps to a short riff that has quite a meaty texture. The chorus is a chord driven segment that derives its oomph from Rob Halford's vocals. The band jumps into an intriguing jam after the first chorus, then they move it back to the earlier verse segment. They follow through as previously, but then slow the jam way down for the closing title sung by Halford. It seems odd to include this cut without "Dreamer/Deceiver", since this one really feels like an extension of that number. Based in a solidly metallic pattern, "Deceiver" works best as counter point to the progish textures of that number. Still, it is a strong metallic stomper. The number closes with the acoustic guitar mode that first shows up on the studio release on "Dreamer/Deceiver". Based on a seemingly unique old Priest sound, "Tyrant" is heavy metal, but not the generic variety. Although not a real standout, this is a strong track. The guitar solo is inspired and exciting. "Mourn for our souls, pressed in fear, chained and shackled, we are bound, freedom choked, in dread we live, since tyrant was enthroned". Originally from Unleashed in the East, this is one of the best cuts Priest have ever done, this live take is stronger even than the studio version. It is certainly old school metal at its finest. This rendition of the Priest cover of this Joan Baez cut feels more lively than the one on the Unleashed…album., mostly due to a stronger drum presence. This one is definitely a treat for the long time Priest fan. I have never heard them do this one in all the times I have seen the band live. They start it here with a whirring feedback like on Stained Class' "Invader", but quickly jump into the gritty riff driven Priest classic. This is a rather bluesy rocker, but is all Priest. I have to say Halford sounds a little weak at time here, though. The extended outro and the guitar solo are quite cool, but I could have done without the drum solo on this one. A noisy intro gives way to the meaty fast paced riff. This studio version has never been as strong as the cut is live, but it still packs a solid punch. This one has some killer changes and intricate musical segments. The slower segment, with its screaming guitar jabs has always been a highlight of this cut, almost a metal band's take on space rock and Grateful Dead type jamming. I love the fact that the guitar still screams out in soloing fury during the vocal segment here. This cut is a bit strange. It starts with an almost chimey guitar segment that builds slowly, then Halford's soaring vocals say, "Call for the Priest, I'm dying". A short staccato transitory segment gives way to a frantic jam that is just a little off-kilter. The chimey guitar returns later atom the faster rhythm section, Halford singing over top. Then a quick guitar solo gives way to the earlier fast section. This, after a vocal segment, turns to a fiery guitar feud between Downing and Tipton. The ensuing changes and neo-classically tinged jamming certainly predicted the European classically oriented power metal that was still years away from existence. The band pull it back to the frantic main riff for the final verse and outro. This has always seemed like one of the fastest and most aggressive jams Priest has ever done. A tension builds to start this, then Halford's scream heralds in the fury that makes up the main structure of the cut. The guitar soloing is furious. It drops to a slower segment before jumping back up to the earlier fury. This one is still a scorcher. This screamer is another frantic rocker. It never wavers and has an awesome musical texture. This has always been a personal favorite and makes a great addition here. This has one of the latest examples of the early Priest guitar sound. Even amongst 4 CD's, this is a highlight. A balladic verse segment makes up the early moments here. The chorus turns to quite a strong metal screaming segment. The song alternates between these modes in one of the best of this style track. The main riff to this has always reminded me of Aerosmith's "Mama Kin". This one is a very solid Priest number, but never one of their best. This tale of an alien invasion starts with guitar effects feedback lending a flying saucer sound. As the saucer speeds up to take off, the group jump into this bouncy metal piece. It's another strong cut, but not an essential number. The guitar solo segment has a suitably spacey sound. This rocker is a killer. A meaty riff and great vocal line help this one soar. Of course, the killer arrangement doesn't hurt either. This one is a different live take on Priest's rendition of this blues incarnation Fleetwood Mac tune than the one on Unleashed in the East. It feels a bit more energetic, but like "Diamonds and Rust" earlier in the set, the difference is mostly in the drumming. Halford only gets in the last part of the famous ending non-lyrical section, letting the audience sing it. Personally, I prefer his singing to theirs. The outro here is quite extended. Another that has never really done much for me, this ode to S & M has a very stripped down arrangement. Halford's vocal performance is pretty stellar at times, though. One of Judas Priest's breakthrough numbers, this recording feels a bit weak. I wonder if the studio rendition of this metal standard would have been a better choice for inclusion. Starting on drums, this rocker is another of the band's best known pieces. I am not crazy about it, but I'm probably biased after having rehearsed it hundreds of times in various cover bands. That kind of repetition can kill any song for you. This frantic number is definitely a winner. The drumming here really keeps the pace fast and furious and Halford's "rapid fire" delivery keeps up the tension. This song is well titled, that much is certain. The second segment is particularly furious, and I love how the guitar punctuates each "catch your breath" extended vocal line. This is a rather plodding cut, and the sci-fi lyrics are a bit cliched and juvenile, but somehow it still works remarkably well. The solos on this one are quite meaty. When Priest released Point of Entry, I believe they coined the term "progressive metal" to describe the sound, but this cut from British Steel, the previous album is truly the first example of that type of sound. While I am not sure that that term even really applies to either this cut or to the Point of Entry album, I would say that this is definitely not the Priest sound of old. This cut, starting, and driven by the bass guitar, has always been a favorite of mine. This has it all; slower segments, a powerful arrangement, great soloing, and a killer vocal performance. This does really represent a new type of metal that would certainly be worth further exploration. This is a straightforward metal cut that holds up well, but is not exceptional. This fast pace rocker feels rather stripped down live. Not a stand out, it still holds its own. Drums begin this, feeling a bit like "Living After Midnight". As the rest of the band joins in it feels almost funky. This one is another that is not great, but stands the test of time. The chorus is one of the standout portions of the piece. Coming in hard edged and fast, this one shifts toward the more melodic as it moves forward. It is an anthemic sci-fi metal cut with a classic Priest sound. Another originally from Point of Entry, this one starts slower and more tentatively, but picks up the pace as it carries forward. Always a favorite of mine, this is a killer arena rock balladic number. This pair of cuts from Screaming For Vengeance are presented here for the first time on CD in this live version. The instrumental "Hellion" is a dramatic intro to this hard rocking Priest classic; still a mainstay of the band's live set. When this one was originally released its big brotherish tale of electronic surveillance seemed like science fiction. In today's world it has become a grim reality. Taken from the album of the same name, this is, appropriately, a screamer. It is frantic, angry and a standout cut. This fast paced rocker is solid, but not really a standout. Still, some of the riffing is downright classic. This track has never really done a lot for me, and classic that it is, I still feel the same way. It's a competent Priest rocker, but really, other than Halford's killer vocal performance, it just doesn't grab this reviewer. Now for something completely different, I have always felt that this cut is one of the most empowering and strongest from this period in Priest's history. It still holds up every bit as well, even years down the road. Another that has never really gotten under my skin, this is solid enough, but a bit too generic. This live rendition is among the previously unreleased material found in this set. It is another that has never done a lot for me, but still, the inclusion is cool. A killer metal balladic song, this one is dramatic and powerful. It is a great choice for this set. The Turbo album is arguably the weakest disc in the Priest catalog. In the view of this reviewer only the strong vocal performance makes it listenable. This cut is actually one of the strongest from that disc. With that mind, the comparison to the rest of the material here is a dramatic contrast. Another from Turbo, with its keyboard intro and generic lyrics, this one definitely doesn't cut it. An anthem for the teenybopper crowd, this one is just plain silly lyrically. It seems to have been going for a rather generic '80's metal sound musically. This is one of only a couple "skip 'em" cuts on the collection. This ballad, another from Turbo, is actually one that works. Although there is still something troubling about keyboards on a Judas Priest song. Another previously unreleased cut, this one is a fairly stripped down rocker, feeling a bit like the Turbo material. Considering that it probably came from that period, one has to wonder why it didn't make the album. Although not particularly strong, this one is better than a lot of the material that did make that cut. Priest's album after Turbo seemed an apology for the previous release, coming in harder rocking and more straightforward than a lot of their other material. This title track opens with a patented Halford scream that sets the tone for the fast paced metal frenzy that follows. This one is a definite screamer. Okay, ignoring the ultimate in cliched titles, this opens with guitar riffing then moves after a time to a straightforward rocking structure. This one comes in feeling a bit like Sammy Hagar does Judas Priest, but the screaming solos and Halford's snarl leave no doubt that this is the Priest. Lyrically this is quite cliched, but the stomping sound will make you ignore that. This metal ballad has always had a killer forlorn texture that makes it a favorite of mine. With drums bringing this one in, it is one of the most frantic and hard edged tracks the band has ever done. This one is a standout, even on as massive a collection as this is. This one is a fairly strong rocker that at times calls to mind the early Judas Priest sound, while still updating it. It rocks out hard and fast. Starting slow and a bit melancholy and mysterious, this one is a slightly generic, but still quite strong rocker. The addition of keys, along some quirky changes actually adds to the effectiveness of this one, moving it beyond generic basis. There are points where this feels just a little bit like Iron Maiden. Screaming guitar begins this fast and frantic metal excursion. This one rocks out very hard, but is not a real standout. Halford manages a soaring performance, though, and the chorus is a highlight, although the title is very trite. This one comes in feeling a lot like something you might hear from a Goth metal band, but as the song proper emerges, this is all Priest. A later segment feels like creepy late period Alice Cooper. Another scorcher, this is a soaring metal cut, and always a favorite of mine. It is aggressive and tasty. The first cut on the compilation to feature Ripper Owens in place of Rob Halford, this one comes in with an industrial tone, then turns to become more of a dirge. It is dark and heavy, feeling like something from Alice Cooper's Brutal Planet disc. Owens' scream is almost up to par with Halford, and this song really rocks, but it feels a bit too nu-metal for Priest. This metal basher is also a dark one. It rocks out hard and fast. With a gritty and very hard-edged texture, this cut is lyrically a remaking of "Hell Bent For Leather". However, this time it is a car rather than a motorcycle. This piece feels a lot like Rammstein at times.